I have been a very bad blogger the past couple of weeks. Things have been very busy in the studio. Above is a sneak peek of what we've been working on. 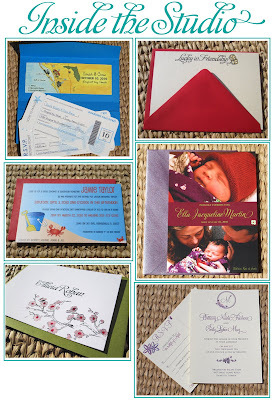 We have been busy fulfilling invitation orders, working on some new maps and boarding pass invites, completed a cute beach themed baby shower invite and announced a beautiful baby girl to the world. The creative juices have been flowing with our newest collection, brush strokes. In this collection, you will find hand painted stationery. I can't wait to debut it to you all.